New York Lt. Gov. 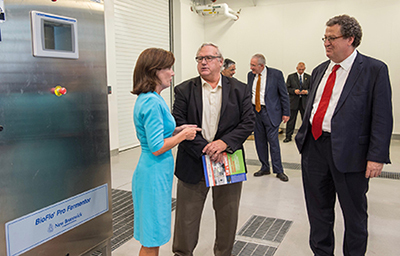 Kathy Hochul joined ESF President Quentin Wheeler Wednesday, Aug. 24, for the official opening of two ESF laboratories at the Syracuse Center of Excellence for Environmental and Energy Systems. Hochul presided over the debut of ESF's Biofuels Pilot Lab and Analytics Lab. President Wheeler said, "When great scientists and engineers are given great facilities and support by state and federal government agencies along with great partners in academia and the private sector, great things can happen." The COE provides ESF faculty and students access to facilities and equipment that will allow them to scale up new bio-based technologies from the lab scale to near-industrial levels of production. The biofuels plant is a key element in ESF's initiative to create a wood-based biorefinery. The analytical lab will include a suite of state-of-the-art instruments that can determine the characteristics of products generated in the facility.